I have IntelliJ Ultimate 12.0.2 installed on my local windows 8 machine. I have Ubuntu Server 12.04 LTS installed on a virtual machine on my local network. 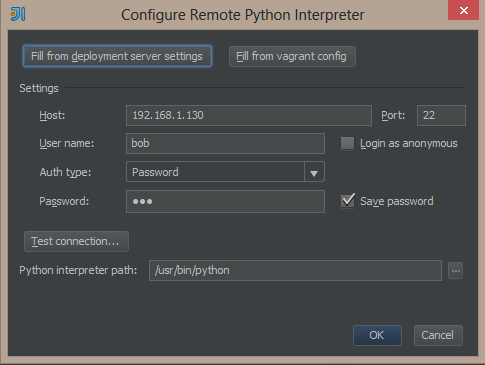 I'm wanting to setup IntelliJ to use a remote Python interpreter. I take the following steps. Can anyone help tell me what I'm doing wrong please? You did more progress than I did. I've been struggling to simply create a Python project with IntelliJ Ultimate 12, the only documentation I find says I need to create a project from scratch and create a JDK that points to the Python Interpreter. Does not seem we can do that with the new version of IntelliJ. A little help would be appreciated here. 3) In the new window search for "python" and you should find "Python v.2.10.0Custom Languages"
4) Right click on this and select "download and install"
3) Give your projet a name and click "Next"
4) Add a the path to you python interpreter. 5) click "Next", "Next" and then "Finish"
So contrary to my previous post even though the interpreter is shown in red it still works and you can start a Python console using it from within IntelliJ. I'm unsure as to what the red signifies and whether this indicates that there is some problem? I did install the plugin as you mentionned. It is when I selecte File->New Project that I have a problem. There is no python to be found on the language selection. 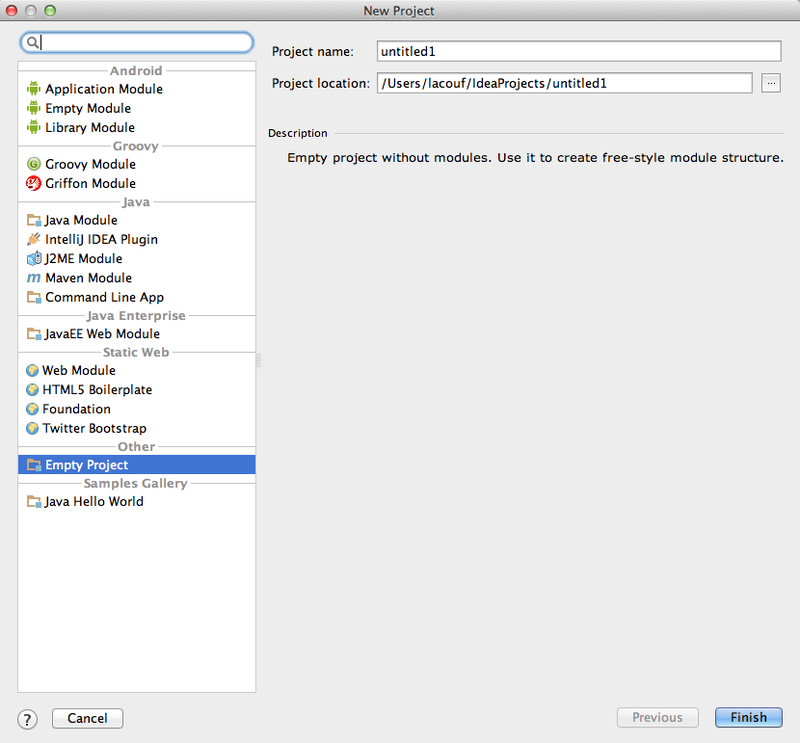 I have 'Android, Groovy, Java, Java Enterprise, Static Web, Other (Empty Project), and Simple Gallery. But no python. There must be a setting somewhere to make it appear in that window. I have included a screen shot of the 'New Project' dialog. Ok, I can create Python projects now. I had to uninstall the plugin and reinstall it again.